Sinor-LaVallee Wine Company was founded in 1997 by the husband and wife team of Mike Sinor and Cheri LaVallee Sinor. Mike and Cheri met at Cal Poly San Luis Obispo in 1993 and were married in 1996 in the French town of Beaune, in the heart of Burgundy. Mike was first introduced to the wine business when he took a job at Corbett Canyon Vineyards in 1991 to pay for college. He quickly became enamored with the wine business and added several nearby Edna Valley wineries to his growing employment resume. 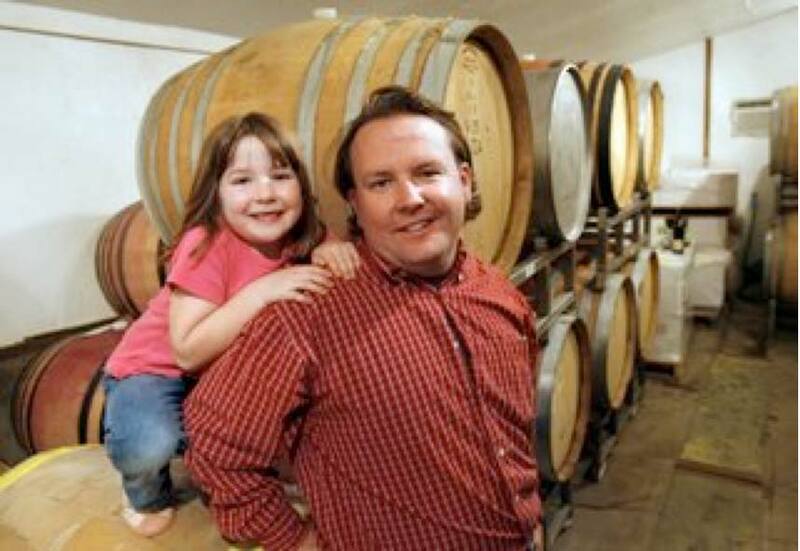 For the 1993 vintage, he took some time away from school to work full-time at Saucelito Canyon Winery. After finishing Cal Poly in 1994, he joined Byron Vineyard and Winery and rose quickly to Assistant Winemaker to Ken Brown. While at Byron, Mike traveled to France and studied the vineyards and wineries of Burgundy. He left Byron after the harvest of 2000 to assume the role of winemaker at Domaine Alfred Winery in San Luis Obispo. At Domaine Alfred, Mike also supervised vineyard operations including the biodynamic aspects of farming the 130 acres of vineyards. After producing five vintages of highly acclaimed Pinot Noir and Chardonnay at Domaine Alfred, Mike departed to concentrate full time on his Sinor-LaVallee label and do consulting for other wineries. Cheri also entered the wine industry to help pay for college. After meeting Mike, she quickly caught the “wine bug” from him. After graduating from Cal Poly in 1994, she worked in the Corbett Canyon Vineyards tasting room and later became Executive Director of the Central Coast Wine Growers’ Association. In 2001, she left to become a full-time mother and manager of the Sinor-LaVallee household as well as President of Sinor- LaVallee (this lady is busy!). 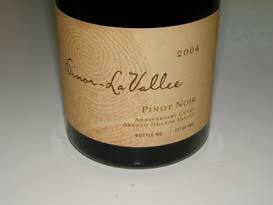 The 2004 Sinor-LaVallee Pinot Noirs were previously reviewed in the PinotFile and were recently re-tasted along with two of the 2005 Pinot Noir releases. 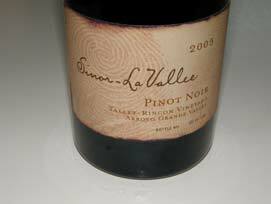 Sinor-LaVallee works primarily with two vineyard sources - Talley-Rincon and Aubaine, both in the Arroyo Grande appellation, producing three distinct Pinot Noirs. Total production is about 400 cases. Mike’s wines are not meant for the timid. They are darkly colored and vigorous with flavor and character. Time is needed for the aromatics to emerge and decanting will improve accessibility. The Talley-Rincon bottling is less dense and penetrating than the Aubaine wine. The Aubaine Vineyard is a “frontier” vineyard” located near the town of Nipomo, just a few hundred yards west of the Arroyo Grande Valley. At 800 feet elevation, it is one of the few vineyards in California where you can view the ocean. Yields here are very small. The Talley-Rincon Vineyard is eight miles northeast of the Pacific Ocean with plantings dating to 1982. It consists of 38 acres of Pinot Noir, 46 acres of Chardonnay and small amounts of three other varieties. Many vines are own-rooted. The soil is shallow and well-drained and yields are less than three tons per acre. 14.9% alc., 151 cases, $40. This 14-acre vineyard is located just off Highway 101 between the towns of Arroyo Grande and Nipomo. At an elevation of 840 feet, it overlooks the Pacific Ocean. The wine comes from three different parts of the vineyard planted to Dijon clones 667 and 777. · Dark purple color in the glass. Shy scents of black stone and berry fruits, dried herbs and green tea that expand in the glass over time. Rich and opulent black cherry and black raspberry flavors with a complimentary underpinning of earthiness and oak. Smooth as a baby’s bottom and almost viscous in texture. Very leathery but in a $2,000 Prada coat kind of way. Still has some tannins to shed and some integration to achieve, and a little alcohol peaks out as it warms in the glass, but this is a prodigious wine. Very good. 14.5% alc., $35. · Very dark reddish-purple color. Super ripe dark fruited aromas with some prune and marzipan notes. Dark, dark black cherry and black raspberry saucy fruit with hints of raisin and musk, finegrain tannins, a velvety texture and a crisp, clean finish. A Pinot that exhibits a considerable amount of power that has been corralled nicely into a well-balanced libation. 14.5% alc., $35. · With some air time, scents of dark berry jam and restrained oak emerge. Saucy, fat and lush with dark fruits kissed by anise, mocha and oak. Supple tannins lead to a refreshing and dry finish. This wine plays more to classic Pinot. 14.5% alc., 100 cases, $35. From a one-acre block planted to clone 2A. · With swirling, aromas of dark fruit, dark caramel and vanillin emerge. Powerfully flavored deep, dark fruits with gripping tannins, but remaining smooth and suave. Intense and lasting dry finish. 14.5% alc., 46 cases, $40. 100% whole cluster fermented from Talley-Rincon and Aubaine vineyards. Foot-stomped by family and friends to celebrate family and marriage. · Intoxicating scents of black raspberries and blackberries, nicely oaked. A big-boned wine with plenty of sweet dark fruit but retaining a mouth filling plushness and smoothness. A welcome citric tang brings up the finish. Fans of the hedonistic style of Pinot Noir will go ga-ga over this one. This wine should drink beautifully for many years ahead. Sinor-LaVallee wines are sold primarily through a mailing list at www.sinorlavallee.com. The phone is 805-473-8313.